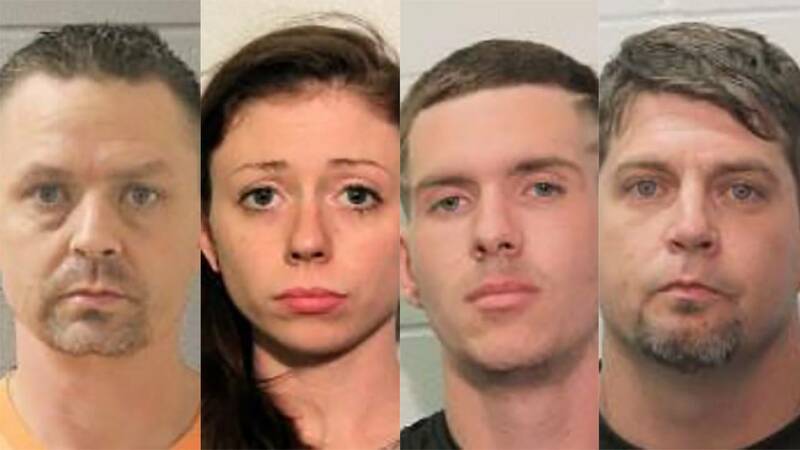 From left to right: The mugshots of Zackary Ryan Hoppe, Kaci Michelle Walker, Matthew Robert Biano and Derek Ray Hall. HARRIS COUNTY, Texas - Five people are facing charges after 200 guns were stolen from a Deer Park home last year, according to court documents. Zackary Ryan Hoppe, Kaci Michelle Walker, Matthew Robert Biano, Morgan Sproles and Derek Ray Hall have been charged in connection with the case. Authorities said Biano's grandparents were the victims and they believe their grandson was responsible. Biano's grandparents said he is addicted to meth, according to court documents. On Nov. 14, 2018, authorities said 200 guns, valued at about $20,000, were taken from a home in the 4000 block of Bluebonnet Trail in Deer Park. One of the stolen guns was a Smith and Wesson .38-caliber handgun valued at $800, according to court records. Biano's grandparents said he lived at the residence for several years but didn't have access to the locked bedroom where the guns were taken from, officials said. There were no signs of forced entry into the house, but the bedroom door was kicked in, according to authorities. During an interview with authorities, Biano admitted to breaking into the bedroom and stealing the guns, court documents said. He told authorities Hall and Walker also participated in the theft, according to officials. Biano said they loaded the stolen guns into a vehicle and took them to a hotel in the 8800 block of Airport Boulevard, court records said. Several guns were sold out of the hotel room and others were traded for drugs, according to officials. Biano told authorities that some of the guns were left inside the hotel room when he left. Hall and Walker were arrested on Nov. 18, 2018, on unrelated charges, officials said. During an interview, Hall told officials that he was present during the burglary, court records said. Walker and Hall both confirmed Biano's story, according to court documents. Sproles is accused of helping sell the stolen guns. Court records show that, during an interview, Sproles told authorities that she knew the guns were stolen. She said she had several people interested in buying the guns but was unable to find a buyer, court records said. She said she didn't have any of the guns in her possession and she deleted the photos of the guns from her phone when she learned others were being arrested for their involvement, authorities said. A warrant has been issued for Sproles' arrest. Authorities said Hoppe was pulled over on Dec. 20, 2018, for having an expired registration tag. When officials searched his truck, six of the stolen guns were found stashed under the hood, near the engine, according to court records. About 100 grams of crystal meth was also discovered in his truck, according to court records. He was subsequently charged with possession of a controlled substance. During an interview, Hoppe told authorities he drove Biano, Walker, Hall, and the 200 stolen guns to the hotel in November, according to court records. He also told officials that he paid for the hotel room and helped carry several guns to the room, court records said. He also told authorities he helped sell several guns and took about 20 guns with him when he left the hotel room, authorities said. Hoppe is not a stranger to the law. According to court records, in 1999, he was convicted of aggravated assault causing serious bodily injury. In 2005, he was convicted of his third driving while intoxicated charge, according to court documents. Walker was charged with engaging in organized criminal activity, Biano was charged with theft of a firearm and engaging in organized criminal activity and Hall was charged with fraudulent use of identifying information and engaging in organized criminal activity.